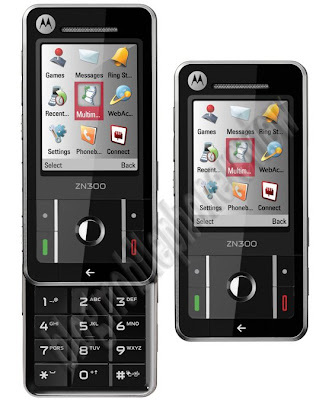 This mobile phone is a third generation in Zn, after a previous ZN5 and ZN200. Although not fully sponsor ZN5 features such as camera, but the facilities offered by Motorola ZN300 can be spelled out no less firm. Of course, there is still a comprehensive multimedia facilities. Slider design is quite compact and solid. Body back there is a 3.1 megapixel camera, equipped with lights flash and 8x digital zooming capability. Interestingly, the process of operation and interface features in ZN300 camera mimics the concept of a digital camera. Including shortcut keys for SHUTTER, switch from camera mode to preview video and pictures. To send the photo, Motorola ZN300 entrust to connect stereo Bluetooth and USB data cable. In addition to direct printing, the image can also result in a portal to online sharing such as Facebook, Myspace, Youtube and Photobucket. In addition, the image recording camera Zn300 can also be changed using the Video Mixer software. The withdrawal other series, also Zn30 Motorola CrystalTalk technology to produce sound when clarity of communication.